Upon entering Yering Meadows, I could not help but feel inspired. 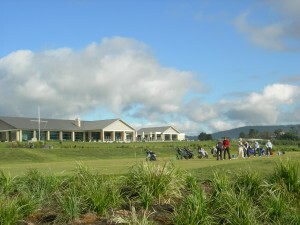 With sweeping views of the Yarra Valley and the crisp, fresh country air, it set the stage for a good day’s golf. The facilities are top-notch. The bright and expansive clubhouse leaves you wanting for nothing, and despite the fact that it is brand-spanking new, the designers have managed to recreate the rich heritage of the Croydon Golf Club. When combined with the ultra-friendly staff, it presents a comfortable and welcoming setting that’s perfect for corporate/social golf days, business meetings, weddings or any other social function. The course itself provides a great challenge. While it may need another season or two to develop its character and playability, there are already some spectacular holes out there. The tees, greens and fairways are in good condition, even if they are still a bit young. (Hint: the bump-and-run might be your best bet for approaches, as the greens are still quite firm). Value for money is the real winner here, as there are some great green-fee rates, and spectacular membership deals available. All in all, I was very impressed with the course, and will look forward to watching it mature into a stellar course. I’d played Yering Meadows previously, and while I was suitably impressed by the layout, I felt that the fairways, greens and planted vegetation still needed a few years’ growth to become a truly fabulous course. In short, the course was still ‘green’ – so with this trip I was interested to see how it was shaping up. Standing on the first, I looked out at the glorious vista with the Yarra Ranges providing a scenic backdrop for the eighteen holes sprawled out before me. As I walked down the first to hit an approach in to the green, I felt that the fairway still needed a season or two to anchor. After flushing my approach – and watching my backward-spinning ball skid through the green — I realised that the putting surfaces still needed time to settle, though they are playing true. On this occasion, I took careful note of the types of plantings. Though not quite creating an impact now, my background as a landscape designer helped me picture how this track will evolve — and that got me rather excited. Stands of trees amongst shrub and grass thickets will evolve in time, generating that third dimension and ‘X’ factor it may be missing now. Many holes provide reward for gusto. It is definitely a thinking golfer’s course. Water hazards dominate the landscape, so straight hitting is the obvious way to obtain a low score and maintain your stock of golf balls. There is little room for error. This, with the growing plants, will enhance the difficulty of the overall layout. The course layout was well thought out, with many spectacular and interesting holes but I couldn’t help but feel a touch of repetition on a few of them. I had to keep reminding myself of what the big picture would bring over time, in terms of the landscaping, and how these “repetitive holes’ would soon separate themselves and become a hole unique to the rest. The par 5 eighth was the showcase hole. Water all the way down the bending left side then cutting across the front of the green. An absolute gem. The clubhouse and facilities were A-class and in time I truly believe the course will follow suit. In terms of the affordable membership, it is money well spent and like the fine wines of the area, it will mature to become a tasty treat. Special membership packages available. Call for details.